For a while now I've been thinking about taking baby T to a playgroup. Now he's mobile he's sure to get some enjoyment out of interacting with other babies often. After some encouragement from a friend, I finally found a local one and signed up. I was pleased I did. The hall we meet in is air conditioned and absolutely stuffed full of toys. The only thing they don't have is highchairs, which is where maxi skirts come in handy! The group is on right near baby T's lunch time. Now he's bigger, he just has solids for lunch and he can make quite a bit of mess. I ended up sitting down on the floor and spreading my skirt out like a little blanket for him so that all the crumbs were caught and not smooshed into the carpet. I've mentioned doing this before when I wore a maxi dress, but I still think it's a clever little 'function' of a maxi skirt or dress, to create a little play mat for baby. 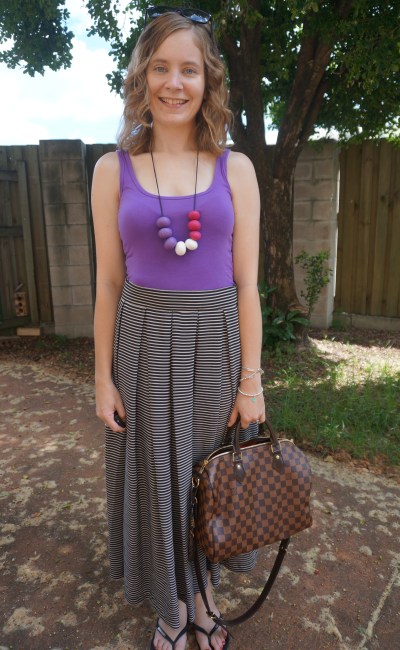 I wore the bright tank as I like pairing this maxi skirt with bright tops, and the teething necklace in case baby T got grouchy when we were at playgroup. Of course I didn't need to worry, there were so many toys to capture his attention. Last worn: Ray-ban wayfarers, purple tank, striped skirt, Havaianas, Louis Vuitton Speedy Bandouliere. Another casual day care pick up/drop off outfit. Usually I'd at least think of my outfits the evening before, but I had no idea what to wear when I woke up in the morning. I went with the easy option of a dress! It's been a couple months since I last wore this one, so it was due another wear. Had the opportunity to work from home, which was wonderful. I thought the dress was casual and comfortable for working from home in the heat, but still professional enough for all of the virtual meetings I attended through the day and for doing the day care run. I am very lucky to be able to work from home, it is perfect for getting to day care early to maximise cuddle time with baby T.
Last worn: wayfarers (above). striped drop waist dress, Havaianas (above), Rebecca Minkoff Love bag. Linking up with Passion For Fashion, Casual Friday, That Friday Blog Hop, Favourite Fashion Friday, Fab Favourites, Skirtista Diaries, Mix It Up Friday, Fashion Friday, Fashion Cache, Let It Shine today. Oh i love the combo of the first dress. I love you in stripes, Mica. That first outfit is adorable. And I need a fit+flare B+W striped dress like yours. Enjoy the weekend with your man and your little boy! <3 Ada. I really must get on the Atmos&here train, you are a good brand ambassador for them - every time I think, "oh that's particularly cute, where did she get that?" it's Atmos&here and off I go to the Iconic! Haha thank you! I wish I was their brand ambassador, #freeclothes woop-woop! I picked up a tee of theirs in the sales and got hooked, worth checking them out! First outfit is so cool! Adore the first outfit! Awesome top and accessory. Love the mix of it with long skirt - it makes outfit fresher! What a clever use of a maxi skirt! I had never thought of using them as a crumb catcher! You look adorable in both outfits. I'm a total sucker for stripes too! What a great playground look! Also your dress is so pretty :) Stunning as always! Love these casual looks on you! I wish I knew more moms around here. Penny would love a playgroup. Working from home would be amazing! So jealous. (; Have an excellent weekend Mica! You're such a caring and adorable mum, Mica! Love your bag collection! At first glimpse I thought the upper outfit was two seperates. The skirt part of the dress has a wonderful cut. And by the way, no such thing as too many stripes (says the woman that just bought two shirts with stripes). They are a fashion classic but always look fresh and instantly add charm to an outfit. It is actually separates, but I agree it would be a cute dress :) I'm definitely a fan of stripes, have so many on my wardrobe now! The striped dress is so cute, and embodies my favorite thing about a dress - looks like a lot of effort, when in fact, it is none. The love your necklace more than I can explain, adore it every time I see it. You look so amazing in purple. Also love the drop waist dress, definitely a favourite of yours. You could always just buy it anyway, no one would be able to tell it was a teething necklace just by looking at it haha. Your hair looks beautiful! And what a genius idea to use your skirt as a mat for the baby! Both outfits look great and I like the purple top with the teething necklace but the second one is my favorite; it is so chic and elegant. it might be because the stripes are bolder in the second outfit. love the skirt! so easy and nice! the striped dress is always a good idea! I love the pleated maxi on the first photo. That's something I haven't seen before. I want that second dress! So comfy and chic all at the same time! That purple top looks amazingly well with the necklace which you have added. Such a lovely piece, I'd love to own something like that to! I can't believe you're back at work already. Doesn't seem that long since you were telling us you were pregnant! Who knew maxi skirts could be so versatile eh?! That is actually pretty handy and convenient when you think of it. Plus you look incredibly chic no less! I'll find any reason to wear a maxi skirt, haha! Adorable! Obsessing over that striped dress! You could wear it so many ways! Love the second outfit so much!! I never put my son into a playgroup because I was worried he’d pick up all sorts of germs & because I was lucky enough to have my mom help while I was working but it sounds like you found a great place for baby T! Hope he enjoys it there! All the outfits are so stylish. Particularly adore your first day back outfit. Great! Not only you are stylish, you are practical. I think our practicality rate goes up with motherhood. Lovely look as usual, especially love the short stripe dress! It does, doesn't it? It's been a good push fr me to get rid of the pretty yet impractical items in my wardrobe for one! Nice outfits! Love the necklace! The last look is my fave - and I am awed at the benefits your country gives you ! I love that your job offers different options Mica! That is such a nice perk. I am LOVING that striped dress on you :) Looks adorable. Glad you found a really good play group.